Check out the ELM datasheet, has the suggest circuit showing how the bus voltage is managed. As for your scopes, check out the Rigol DS1052E/DS1102E. Great value and runs rings around the ones you listed, but is more expensive. A logic analyser with serial decode will ultimately be more useful for this project though. VL400 wrote: Check out the ELM datasheet, has the suggest circuit showing how the bus voltage is managed. Obviously.. both are.. getting expensive.. especially considering the open board logic sniffer for $60, but after reading the amount of comments of people having issues.. Im going to steer clear of that one. Back to the main aim.. So I now offically hate timers, prescalers and interrupts . Bugger them... causing more issues then good! So after all this pain in thinking I need to sort the crystal out ect... seems I overlooked a "relatively" new function micros().. and its great addition delayMicroseconds(). This essentially removes all needs for timers as we can manually fine the SOF,data and EOF. Micros seems to output very accurately which seems to be also supported by fellow arduino gurus. After doing multiple readings, it seems the SOF varies between 190 - 210, but for safety I will maintain Micheals timing values. So now the SOF can be identified... now to move onto obtaining data and finally EOF. And before I forget to note it down (and I will forget!). Utilizing the standard digitalRead() and digitalWrite() is too slow. at roughly 4.1us, this will significantly affect the messages as they are very time sensitive. Thus direct port manipulation must be engaged.. cuts down the time to 0.41us (or less I think). Finally its all making sense...kinda. 3hours later.. and I think iv got it reading . I can send multiple messages from the ELM and successfully grab them on the arduino Mega. On a side note.. its extremely hard to perform debugging on the arduino as any writing to Serial causes significant delays in the timing.. Anyone have ideas on other 'faster' ways to communicate? Or is it best to define some errors/statistics that will display once activity is completed.. which is what Im currently doing back is annoying filtering the data. Eh.. I think that is enough for today anyways.. will start adding major functionality tomorrow. 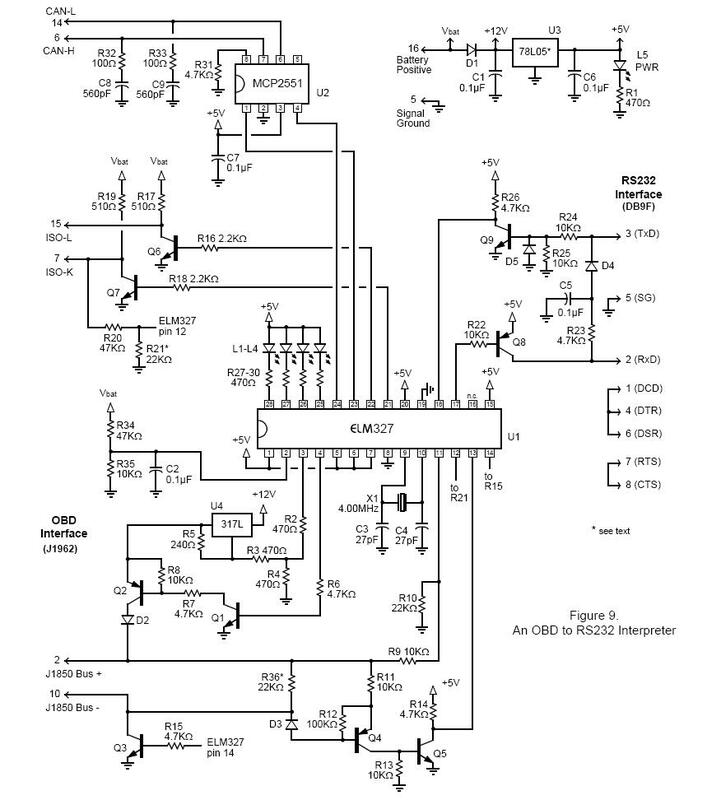 Alright below is the wiring diagram for the elm327.. the bottom left quadrant contains the J1850 (VPW) section.. but for the life of me I dont understand what is happening there. Theres so many transistors and resistors its confusing! Is it possible that the 5v from the arduino mega is *enough* to count as a high along the bus? I know I shouldn't be slack.. Looking at PIN4, look like it is what drives the bus high. So when PIN4 goes high, this will cause the NPN transistor (Q1) to connect up allow a gound connection causing the PNP transistor (Q2) to connect up passing the 7.5v connection (I think! ), So no addition inversion is needed (Sending high on pin 4 results in high on BUS). Good old jaycar has all the parts needed... except the 8v regulator... I could make do with a 5v regulator + two 1.5v batteries maybe? nice little dodgy hackery. I also got the big adjustable voltage regulator I can use.. although the readings are analogue and not very exact.. so that may be a last resort. Hope the aussie seller for the 8v reg will ship quickly. Next up, refining the write procedure and testing it out with the elm327. So the ELM cable can see the responses from the VPWduino (Yes.. Im giving it a name). And the received frames are correct! woop woop!. But, can't try in car or on a proper LS1 pcm yet.. even then I'd prefer to have it all setup correctly with the 8v regulator. For shits and gigs, iv chucked a "rough" 4x VPW mode in.. but have no clue how to test it out! Might be time for an AVT cable finally, or logic analyser.. or oscilloscope! Id imagine all 3 can be used to monitor the bus and see whats going on. Im going to try and follow michaels foot steps and get the module elm327 compatible. But hopefully with 8k sram (on the mega) or 2k sram (on a mini), we wont be seeing any buffer full messages. What confuses me though.. is that if we are reading frames at a microsecond level.. wouldnt this mean that the time required to send over serial (to the PC) could cuase us to miss frames on the bus? so... sending 1 byte at 115200baud = 1 / 115200 = 8.68x10^-6 seconds = 8.68microseconds. Therefore a 12frame message = 104.16 microseconds.. so 1/10th of a millisecond. Soooo whats the normal delay between frames on the VPW line? Based off of my ELM327 software development saga.. looks like theres plenty of time between frames on the bus.. even when doing PDID requests which spams out requests. Looks like a good 200ms of space... unless anyone else knows different? Im not sure about timing as my work has been with the avt which handles collisions and timings for me. But I can tell you the original elm circuit has 4 pins because its used to create a voltage step to round off the corners of the square wave (much like how non-pure sine wave power inverters work). Its to prevent some of the harmonics on the bus generated with a square wave. The different voltage options are not for pulse shaping, its for VPW or PWM (Ford). VPW is 8V while PWM is 5V.